I’m lucky enough to live across the street from a woodland area, and when I go walking in the morning, my pockets are often filled with rocks or sticks or even little critter bones that I’ve picked up along the way. These natural objects are like mysterious sentences in a story or lines in a poem without words. You do that, too – right? 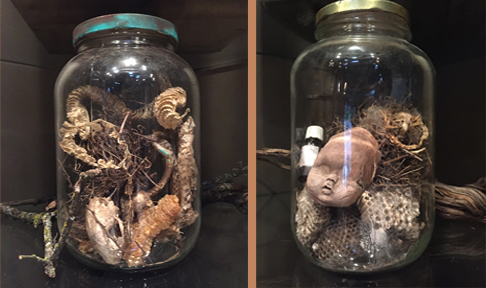 And sometimes, they end up in assemblages and little shrines. 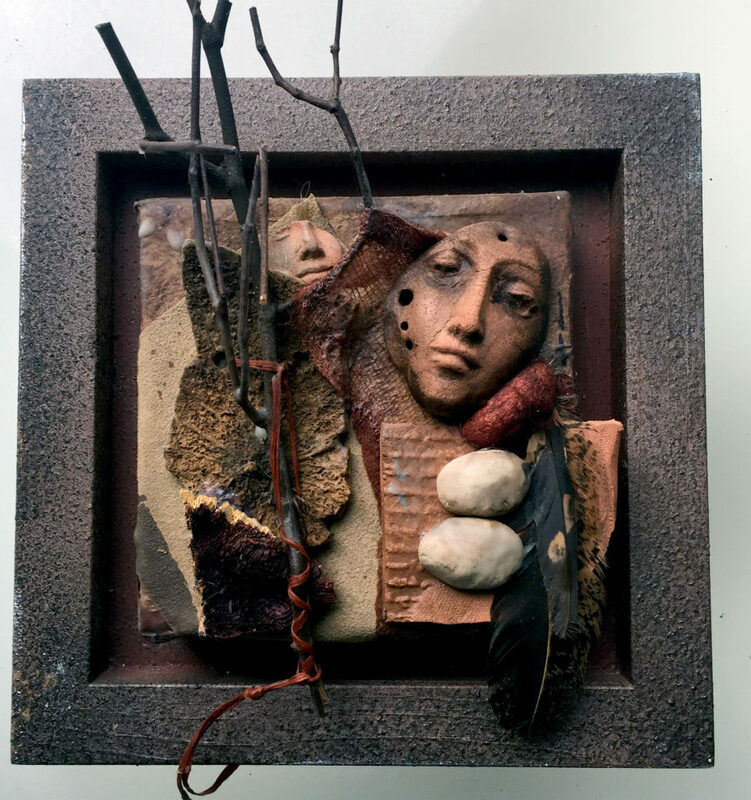 Lyn Belisle will show you how to make small shrine-like assemblages created from serendipitous finds in natural settings. 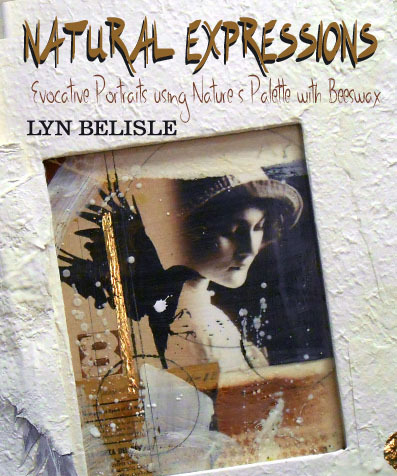 Through the power of storytelling with symbols, Lyn will show you how to construct natural elements enhanced with her iconic air-dry faces. You’ll combine rocks and shards, twigs, leaves to create a meaningful non-verbal story.Then, using unconventional construction methods such as knotting, wiring and wrapping, you will create diverse surfaces on little 6 x 6 canvases that can be displayed in a variety of ways. As part of the Artful Gathering fun, we’re having a Blog Hop. That means that somewhere on my blog page, there’s a secret word for you to collect. It’s not too far, and when you collect all of the words, you can win truly nifty prizes. The secret word is right around here, AND it’s easy ( wink). Click here for more about the Blog Hop. 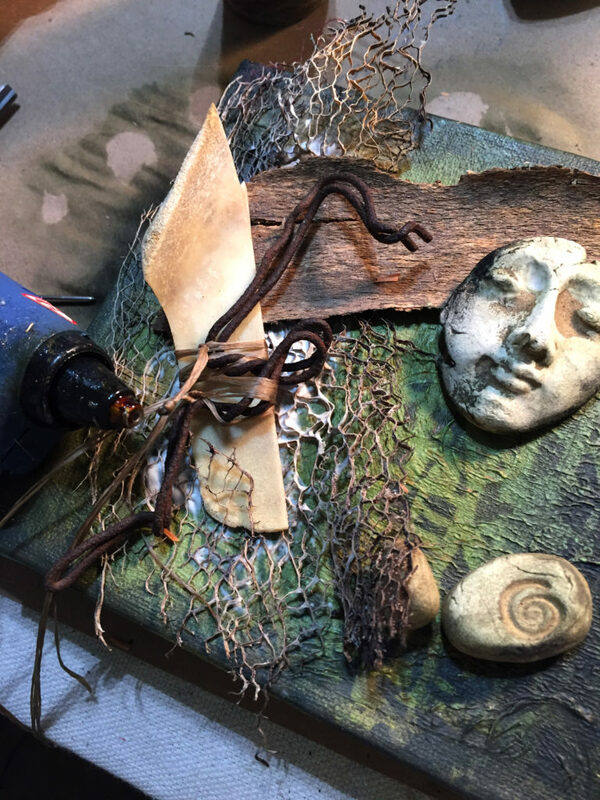 Lyn Belisle guides you through the steps for creating mixed media portraits with natural materials, including layered beeswax. You’ll learn how to enhance digital images, tinting, preparing small stretched canvas substrates for layered collage, assembling a wrapped mat around a canvas substrate as well as attaching natural objects to a mat and integrating them into the mixed media composition. Obviously, I’d love to work with you in one or the other of these classes. We have an online classroom for questions and critiques and extra resources. 2. Check out the Artful Gathering catalog to see the class offerings. Besides mine, there are some great classes by pals Debby Anderson, Michelle Belto, Monika Astara and Luthien Tye, among others. 3. Get out there in nature and collect a little object that calls to you and write a one-line poem about it! Easter Sunday was our chance to explore a new greenway trail in the neighborhood. I had watched its construction on my daily commute to Trinity University last year. It parallels Devine Road, a winding tree-lined route through the Olmos Basin Park. The 3/4 mile trail starts in the Park and ends at the Alamo Quarry Market mall. In fact, I saw a woman walking back along the trail carrying a Chico’s bag – nice combo of shopping and hiking! The weather was beautiful, and the park was filled with families celebrating Easter Sunday with barbecues and egg hunts. Here’s a little video of some of the greenway sights. The brainchild of former Mayor Howard W. Peak, the ultimate vision is to encircle the entire City of San Antonio with a complete ring of trails. When the full system is completed, the connected network of trails along tributaries, neighborhood connections and the San Antonio River will total more than 130 miles. It was fun to get out of the Studio and onto the trail – after all, French painter Pierre Bonnard said, “Art will never be able to exist without nature.” And it’s particularly nice when the trail ends at Chico’s and Starbucks.